Dunk This, Too. 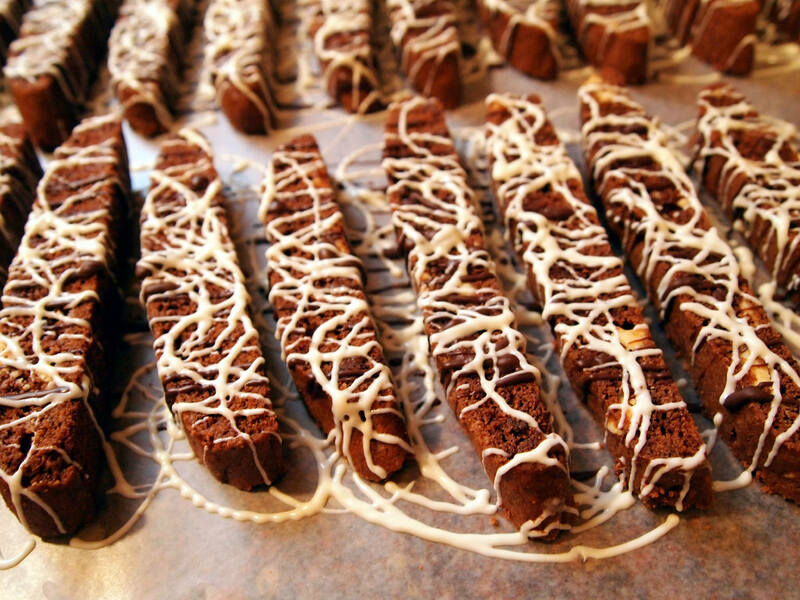 An Absolute Chocolate Biscotti Recipe. Although I was daydreaming about White Chocolate-Ginger Biscotti the other day, my true biscotti love is of the chocolate variety. 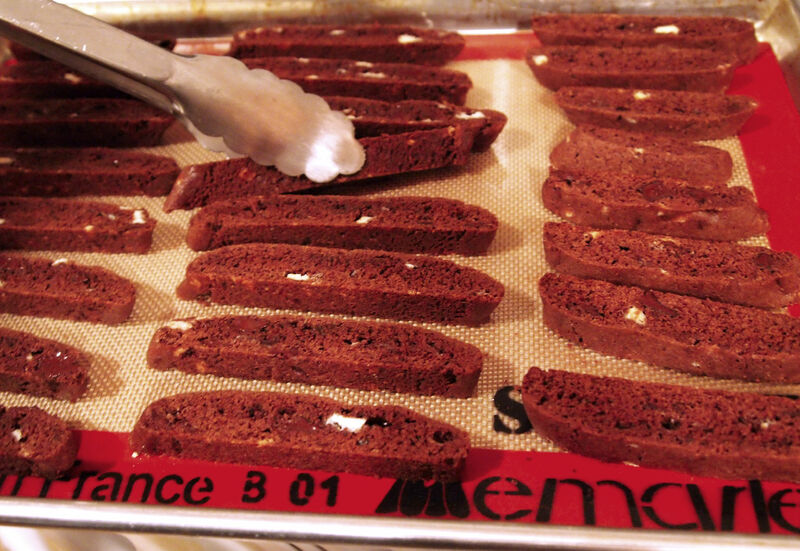 I’ve been baking chocolate biscotti for holiday gifts for as long as I can remember–which roughly translated = a few years. 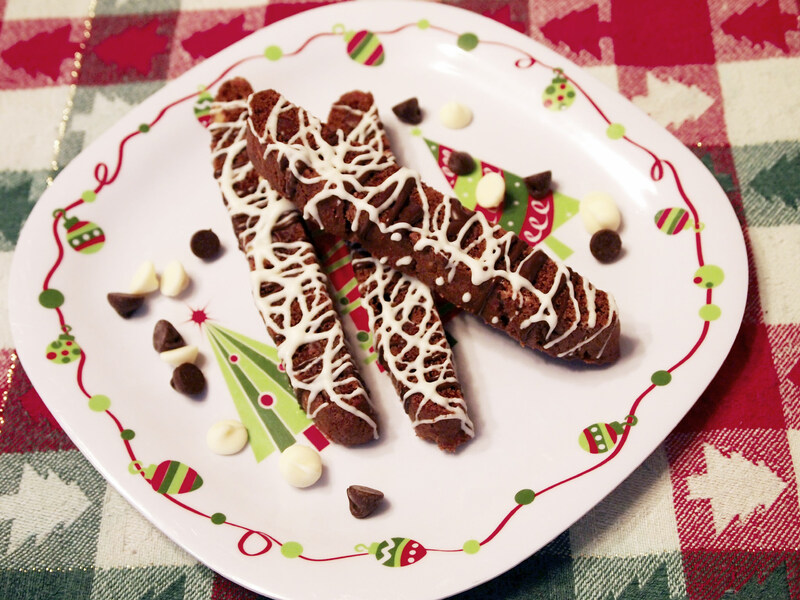 These little dunkers were inspired by my mom–I call them Absolute Chocolate Biscotti. Allow me to explain…my mom is the kind of gal that puts chocolate on her chocolate. And when she’s done putting chocolate on her chocolate? She adds a little more chocolate, just for good measure. My mom is the only woman I know that can eat an entire Peanut Buster Parfait made with chocolate ice cream & extra hot fudge and then complain that it wasn’t chocolatey enough. Seriously. So a million few years ago, back when I was a frazzled mom of (only!) a toddler and a newborn, I decided to make my mom a boatload of biscotti to go with her morning coffee habit. Knowing her tendency to lean toward chocolate excess, I used Hershey’s Special Dark unsweetened cocoa in the cookie dough base. However, I knew that a mere chocolate cookie dough wouldn’t do, so I filled it with bittersweet chocolate and white chocolate chunks, too. Surely three types of chocolate would be enough, right? Maybe. I thought the biscotti were perfect, but they still had to pass The Mom Test. Although they were delicious, they also looked a little flat. So to jazz ’em up a bit, and ensure that they would be chocolately enough for my mom, I melted and drizzled semi-sweet and white chocolate chips over top. Now that’s an Absolute Chocolate Biscotti! Upon eating the first biscotti, my mom declared them to be just the right amount of chocolate. High praise, indeed! 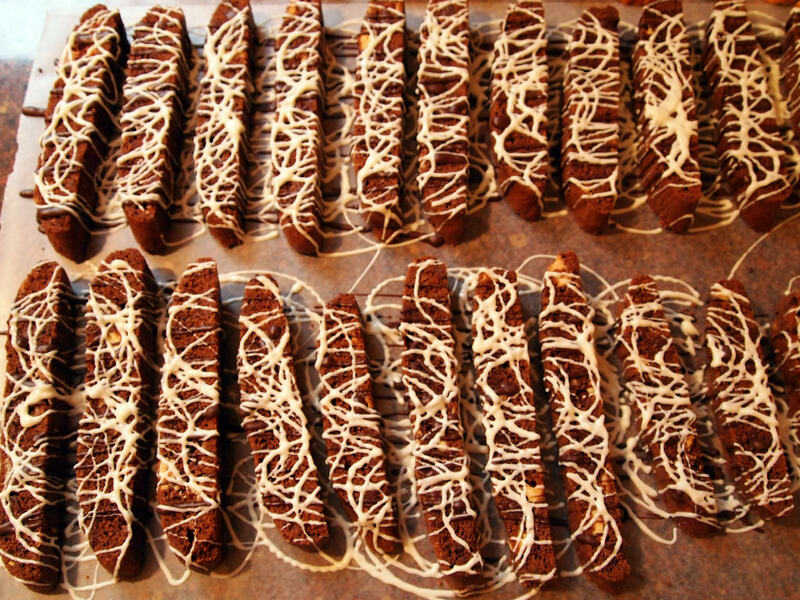 🙂 I promise that if you make these Absolute Chocolate Biscotti for your family and friends, they will shower you with accolades for your efforts. 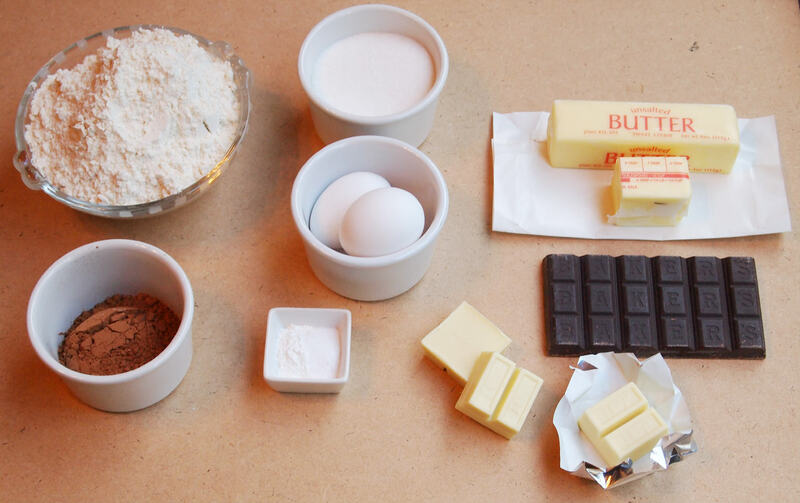 You’ll need: flour, sugar, eggs, baking soda, baking powder, salt, unsalted butter, white chocolate, bittersweet chocolate, and unsweetened dark chocolate cocoa powder. 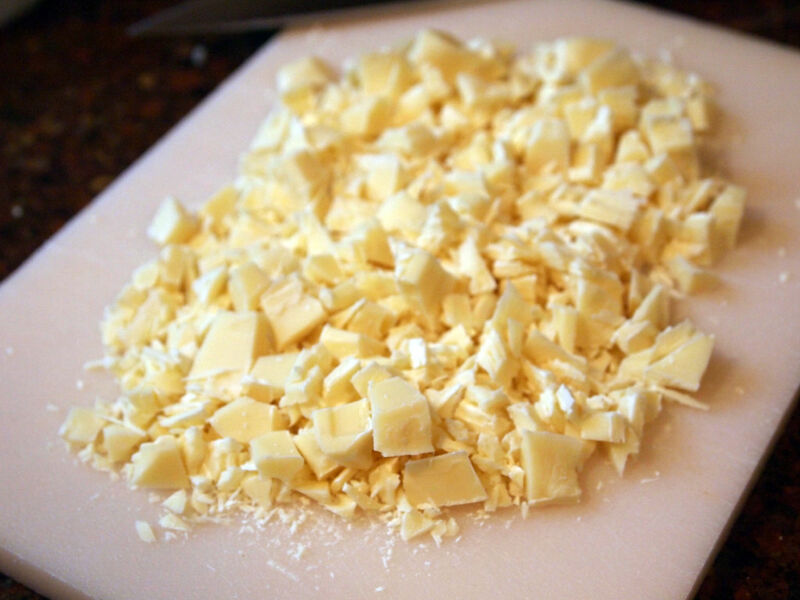 Grab a sharp knife and start by chopping the white chocolate into smallish chunks. 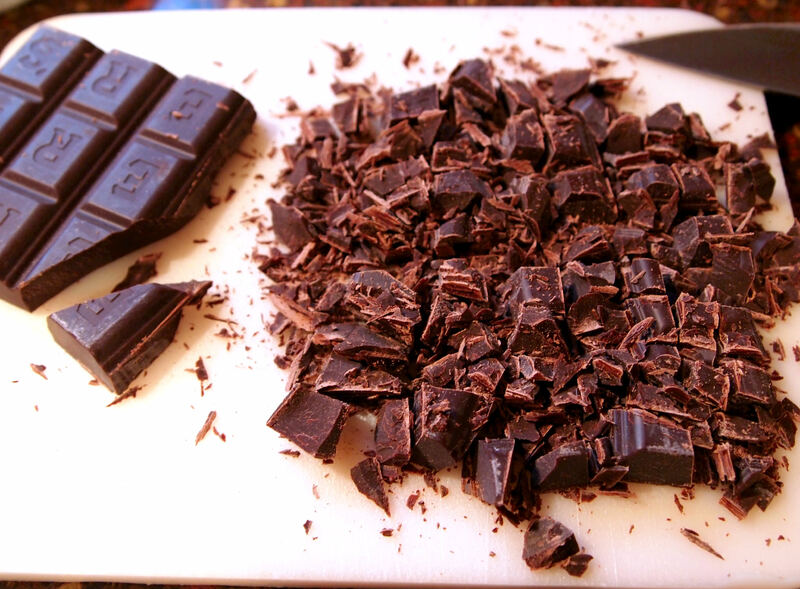 Then move on to chopping the bittersweet chocolate into smallish chunks. Be sure to pop a few chunks into your mouth for Quality Control purposes. Cream together the butter and sugar until it gets nice and fluffy. 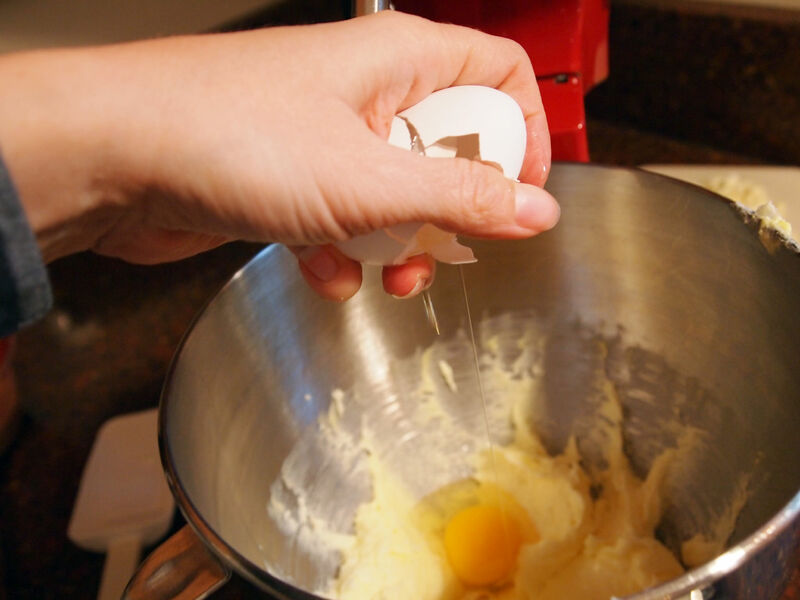 Add the eggs, one at a time, and mix until they are fully incorporate into the creamed mixture. 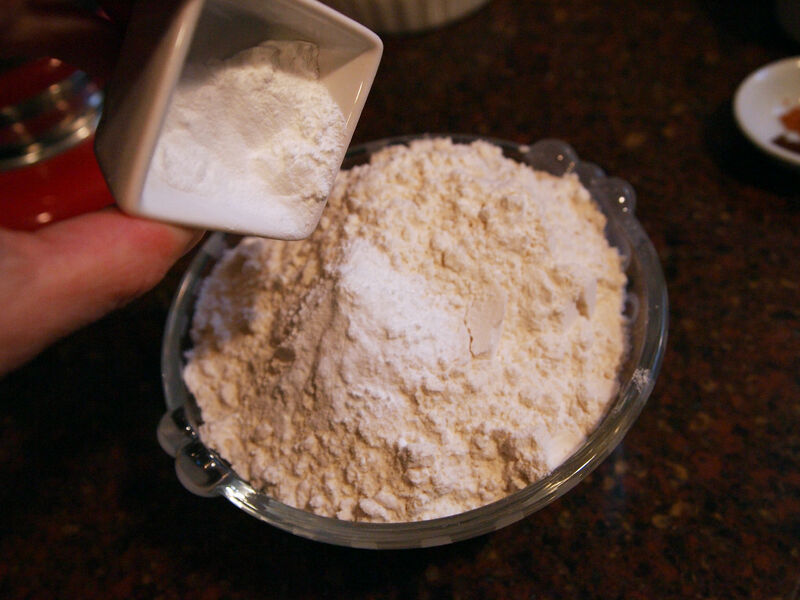 Whisk the flour, baking soda, baking powder, and salt together in a small bowl to combine. Add the flour mixture to the creamed mixture; stirring until blended. Stir the dark cocoa powder into the cookie dough until it’s well incorporated. 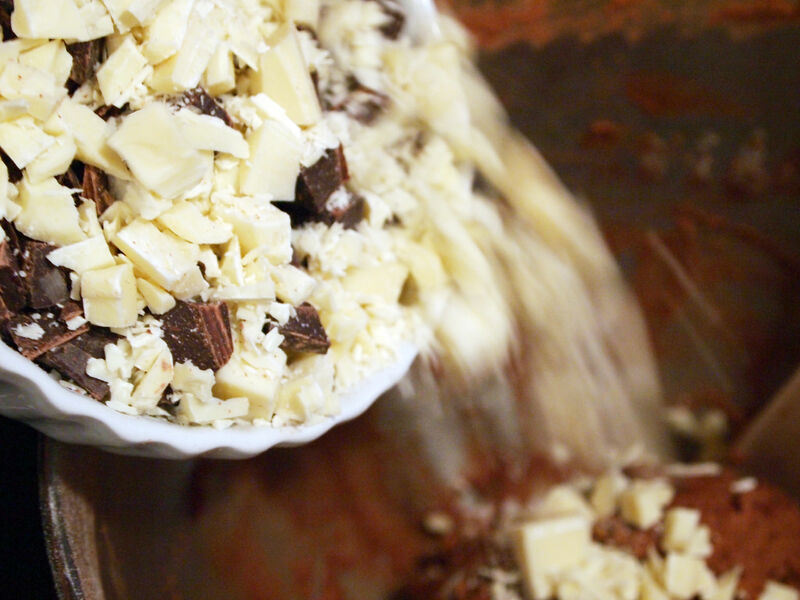 Dump the chopped chocolates into the bowl, stirring by hand to distribute evenly through the cookie dough. Turn the dough onto a baking sheet lined with a silicone mat or parchment paper. Divide the dough in half, roll it into a 12-inch log, and flatten it to 1/2-inch height. Pop the logs–baking sheet and all–into the ‘fridge for about 4o minutes, or until the dough is firm. While you are waiting, preheat the oven to 375° F.
Bake the cookie logs for about 20 minutes, or until a toothpick inserted in the centers comes out clean. Allow the cookies to completely cool on the baking sheet set on a wire rack. Reduce the oven heat to 325° F. Slice the cookies into 1/2-inch wide slices. Place the slices, cut side up, back on the prepared baking sheet, and bake for an additional 8 minutes. Flip the cookies over, and continue baking for another 8 minutes, or until they have dried out, but are not overdone. To cool, transfer the cookies to a sheet of parchment paper sitting directly the counter. Once the cookies have cooled completely, melt some semi-sweet chocolate chips, and additional white chocolate to drizzle over the biscotti. I like to put the melted chocolate in a sandwich bag, and then snip the tiniest bit off of a corner. Then I just move the bag o’melty goodness quickly back and forth over the biscotti to drizzle. In my opinion, the biscotti looks much prettier when I drizzle the semi-sweet chocolate first, and finish with the white chocolate. See? Have fun with the drizzles! Try zig-zagging, circles, curls, or any design you want. 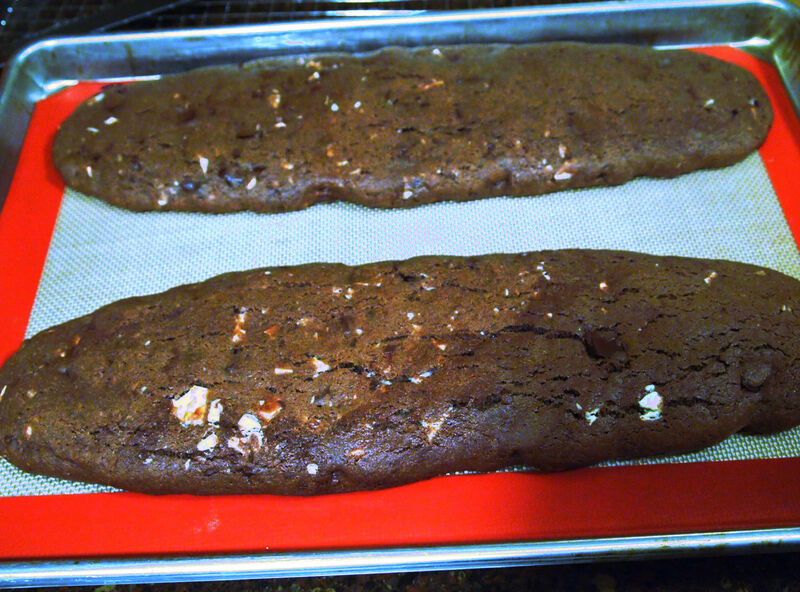 For this batch of biscotti, I zig-zagged the semi-sweet chocolate, and drew big circles with the white chocolate. Fun! As an ingredient note, chocolate wafers make drizzling chocolate over pretty much anything a snap. Fair warning: I’m going to gush for a few minutes. I just discovered these chocolate wafers from a company called Chocoley, and I am totally smitten with them! Chocoley wafers are the most delicious candy making chocolate that I’ve ever tasted–so much better than the waxy, tasteless wafers that are widely available! These wafers actually taste like good quality chocolate! Even better than the taste is Chocoley wafers are peanut free, tree nut free, egg free, and Celiac safe!! By The Way–the folks at Chocoley have no idea who the heck I am, nor did they provide me with any free product. I’m just a mom with a food allergic kid that is tickled to pieces to find great tasting chocolate that is safe for her kid. Amen. A deliciously crunchy, double chocolate cookie that practically begs to be dunked into a steamy cup of coffee or tea. Line two baking sheets with silicone mats or parchment paper; set aside. Chop the white and bittersweet chocolates; set it aside. 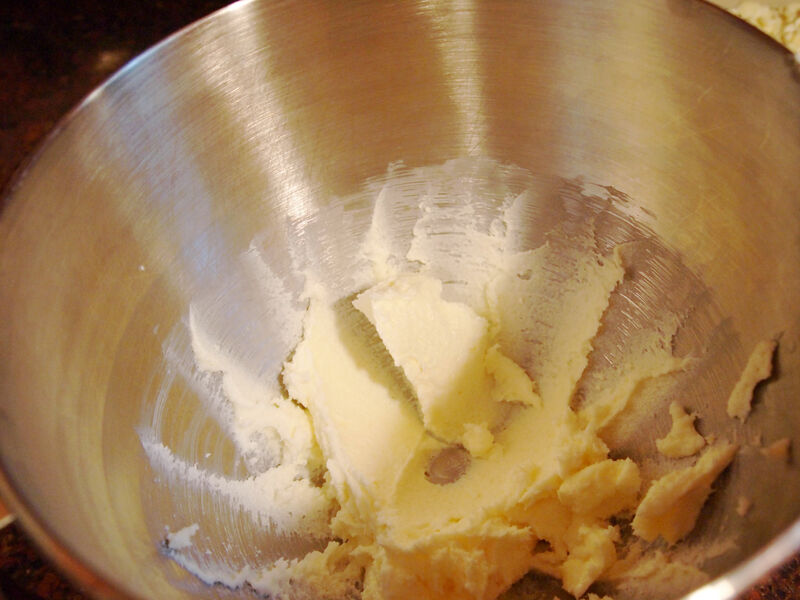 Cream the butter and sugar together in a large bowl, until light and fluffy. Stir in the eggs, one at a time, until blended. 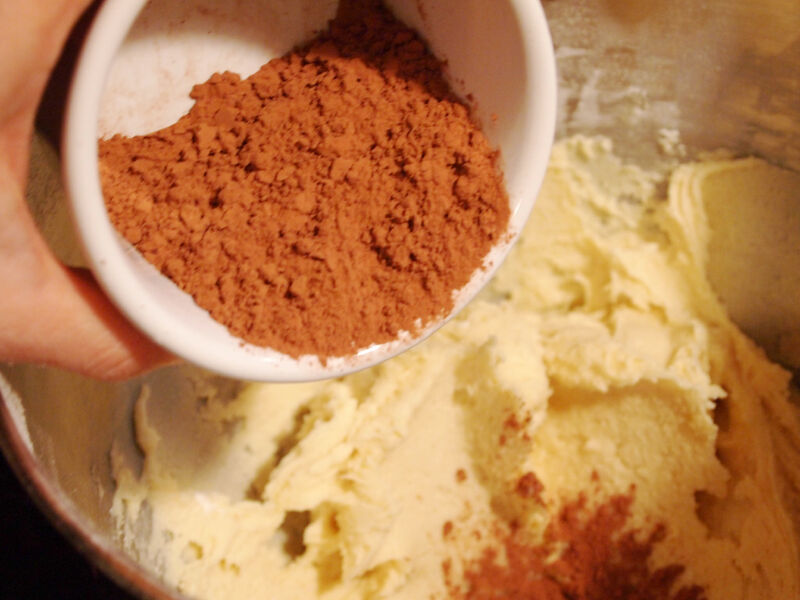 In small bowl, whisk together the flour, baking powder, baking soda, salt, and cocoa powder, until combined. Gradually add the flour to the creamed mixture, stirring until just incorporated. 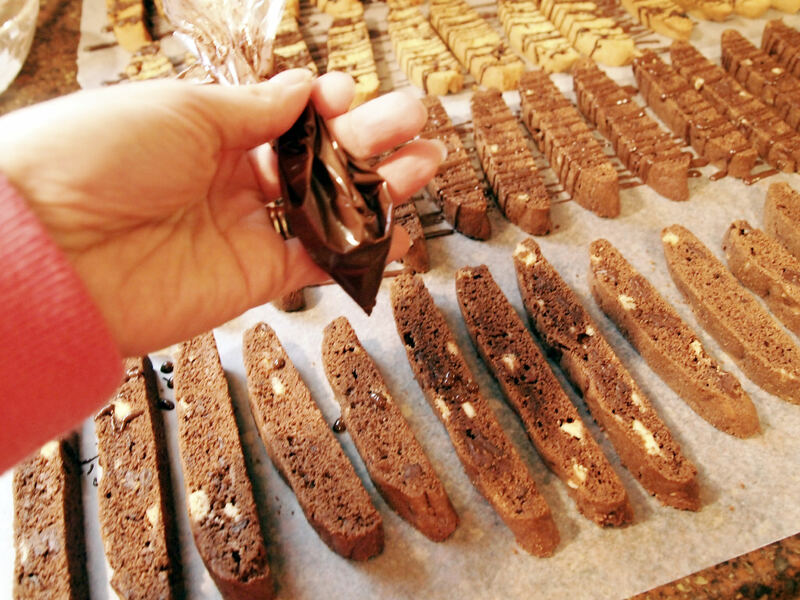 Stir the chopped chocolate into the biscotti dough by hand, until evenly distributed. Turn the dough onto one of the prepared baking sheets. 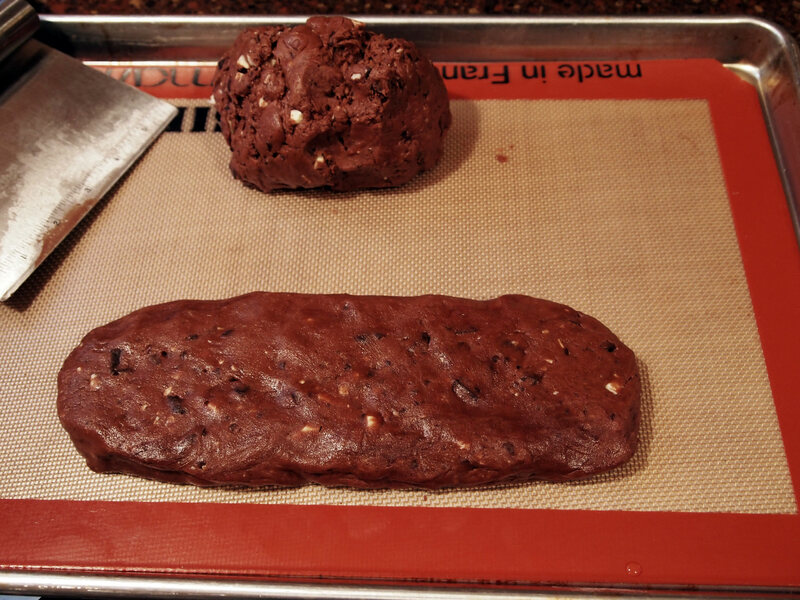 Divide the dough in half, and roll each half into a log about 12 inches long. Gently flatten the logs until they are ½-inch thick, ensuring that they are about 2 inches apart. Refrigerate the dough on the baking sheet for 30-40 minutes, or until firm. Remove the baking sheet from the refrigerator, and bake for 20 minutes at 375 degrees, or until a toothpick inserted into the center of the logs comes out clean. Be careful not to over-bake, or the dough will crack. Allow the cookie logs to cool completely on the baking sheets, set on a wire rack. Once the cookies have completely cooled, preheat the oven to 325 degrees F.
Carefully transfer one cookie log at a time to a cutting board. Use a breadknife to cut the logs widthwise into ½-inch slices, on a diagonal bias. Place the cookies, cut sides up, onto a prepared baking sheet. Be careful not to break the cookies—they will be moist and soft. Bake the cookies on one side for 8 ½ minutes, and then gently flip the cookies over and continue baking for an additional 8 ½ minutes or so, or until the cookies are dry on both sides but not yet browned. Transfer the cookies to a wire rack, to cool completely. Serve the biscotti cookies with coffee, tea, or hot chocolate for dipping. OPTIONAL: Melt additional white and bittersweet chocolate and drizzle over cooled cookies, and allow the drizzles to dry before serving. Previous Post: « Dunk This! Please. Always looking for more biscotti recipes because they are delicious and work great in care packages. 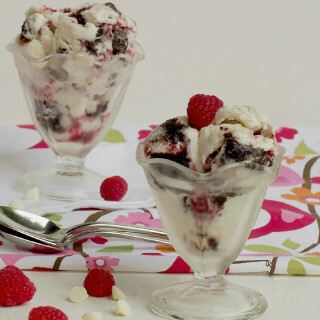 Yours look delicious! The fact that they don't feature nuts is a BIG plus to an allergic cook. I can leave nuts out but that sometimes leaves a recipe kind of plain. 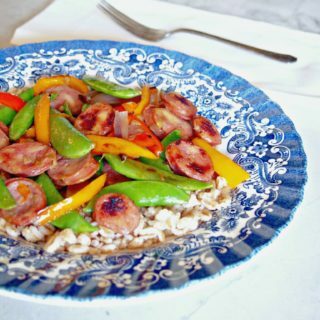 These look anything but plain. I can't wait to try them. Thanks! Wow! That looks so yummy! It's official. I need to meet your mother. Like, yesterday. I think that we would get along just fantastically - too much is absolutely NEVER enough. This is inspiring me to get a-crackin. I've only ever made Megan's Lemon-Thyme Biscotti. It's time to expand the repertoire. I am totally on board with the multitude of biscotti posts. If my coffee pot weren't broken (*eye twitch* *stabby face*), I would totally whip these up. Alas, I will have to imagine a hot cup of brew in my hand, with a chocolate chocolate chocolate biscotti in the other. I'm in biscotti heaven! 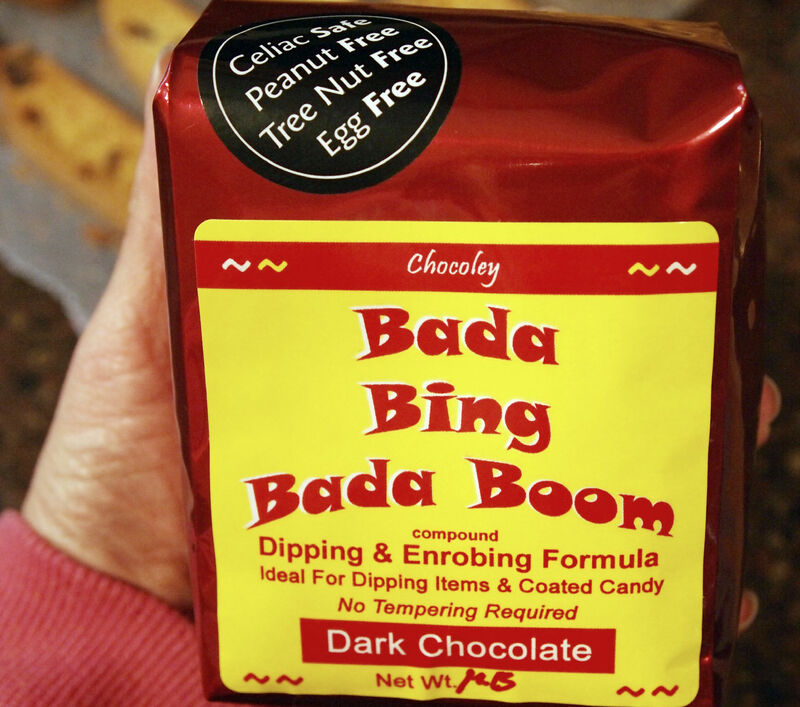 Love the name Bada Bing Bada Boom!